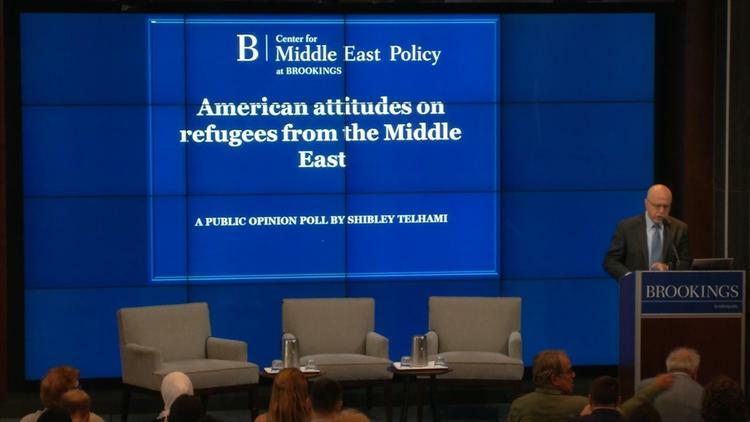 “American attitudes on refugees from the Middle East”: A Public Opinion Poll by Shibley Telhami is just out. Despite the raft of Republican mayors who have pledged to keep Syrian refugees out of their states (that isn’t actually a thing) and the sewage that has spilled from the mouth of Donald Trump, a majority of Americans supports helping Syrian and Iraqi immigrants and letting them into the US, and most Americans recognize that the US invasion and occupation of Iraq contributed to the rise of Daesh (ISIS, ISIL), and so to the crisis in Syria. Of 750,000 refugees admitted since 9/11, only 3 have been arrested on terrorism charges. Most Americans think it is more, and many Americans think it is substantially more. Nevertheless, 59% of Americans support taking in refugees from Syria and other Middle Eastern countries if the US screens them for security risks (it does– it is an 18-month process of scrutiny). 41% are scrooges opposed. The percentage supporting Syrian refugees in particular is a little lower, 53%, probably because of all the bad press. Some 55% of Americans think refugees would be welcome in their communities. With regard to Syrian refugees already in the US, 3/4s of Americans want the country to welcome them and help absorb them into American society. But 21% of Americans would like to expel those already here. From mainstream press coverage of political attitudes this spring, I would have thought that the expulsionists were substantially more than a fifth of the population. Although the threat of terrorism is usually highlighted in the press as a reason to be afraid of the Syrian and Iraqi refugees fleeing . . . terrorism, in fact nearly as big a percentage of those who decline to help these refugees say they do so for economic reasons (41%) as for fear of terrorism (45%). One of the reasons for majority support of taking in Iraqi and Syrian refugees is that Americans feel a moral obligation to do so. 2/3s of Clinton and Sanders supporters feel this to be a moral obligation, while the percentages are reversed among Trump supporters. The moral obligation stems from guilt over the Bush administration’s illegal war of naked aggression on Iraq, which 56% of Americans think had a significant role in creating Syrian refugees, and another 31% said had at least a small role in doing so. I’m actually surprised at these responses, and at how well informed the public is on this matter. Although you could argue that Syria fell apart for indigenous reasons, ISIL wouldn’t have existed to take over the country’s east if it hadn’t been for Bush’s Iraq occupation. ISIL began as the Tawhid of Abu Musab al-Zarqawi, then became al-Qaeda in Mesopotamia, then the Islamic State of Iraq, then the Islamic State of Iraq and the Levant when its fighters went over to Syria to join in the civil war there. Its fighters honed their skills fighting the American occupation army. Many leaders were former Iraqi Baath Party officers. Americans think that the 10,000 Syrian refugees that the Obama administration wants to bring in this year is just about the right number. Millennial youth and Democrats are generally twice as favorable to taking in or otherwise helping refugees from the Syria and Iraq Wars as Republicans, and Trump Republicans are the least charitable toward them of all.